If I remember it well, the cassettes were originally recorded by a collector in Los Angeles. On the tapes are Japanese 78rpm records, that sound very western to my ears, so I wonder if they were made for the American market. This anonymous collector gave copies of the (three) tapes to Art Spiegelman, who sent copies to Joost Swarte. 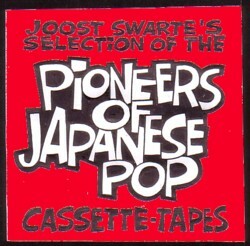 Joost Swarte made a 60 minutes compilation tape, of which he sent a copy to Piet Schreuders. And I got my copy of that tape from Piet. So my tape (which I copied for several of my friends of course) is at least a fifth generation copy. But the sound quality is amazingly good. There was no information with the tapes when they arrived at Joost Swarte, so when he made his compilation he wrote some ad hoc titles to the songs he selected. Market cry , Tonko tonko And Calypso counting , for example. I hope that some day a CD-box of this material will show up, but I am afraid I will never learn to forget these fake titles. A copy of this tape also got in the hands of Fay Lovski, who played at least two of the songs with a band she was in at that time. That band was named The Magnificent Seven and as far as I know they never made an LP or CD. But I have seen them on stage and I remember that they played Tonko Tonko . Not all the music on the tape is up tempo ,and two of the best songs are incomplete, but still this tape is one of my favourites. If you happen to have any information on either the tapes, the collector who made them, or on the original music, please let me know. Here is one of the songs. Frits – I think the tape Fay Lovsky had was from “Best 10 From The Land Of The Rising Sun” 1958, Nippon Columbia AL-103. It may sound like 78’s, but I believe it is merely pre-modern recordings on a 25cm (10”) record. I’ll put a photo of it on my blogspot. >That band was named The Magnificent Seven and as far as I know they never made an LP or CD. The CD The Best of the Worst by The Magnificent Seven came out on Basta (30-9086-2) in 1998. Thanks, i will go after it!